These fully adjustable, rugged arms are recommended for circle track, road racing and drag applications. They allow the user to adjust the arm length and offset to attain the ultimate suspension geometry required to reach the winner’s circle. Each arm can be adjusted up to 2” in length and all components are interchangeable and may also be ordered separately. 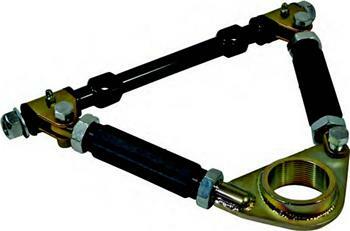 Measure Length of Control Arm – Measure from the middle of the cross shaft to the center of the ball joint. Full Sized GM Truck Bolt In Ball Joint Plate Measure center-to-center between the ball joint bolt holes that are farthest apart. This measurement should be 2-3/4” SPC Ball Joint part number is 92004. GM Metric (Midsized) Bolt In Ball Joint Plate Measure center-to-center between the ball joint bolt holes that are farthest apart. This measurement should be 2-1/2” – SPC Ball Joint part #92006. Also in 20° – SPC Ball Joint part #92008 & 92009. Chrysler Screw In Ball Joint Plate – SPC Performance offers ball joint plates that are welded flat (0°- SPC part #92003) or at an angle (10°- SPC part #92002) for these screw in type ball joints.